What is the TRU™ System? TRU (Tree Radar Unit) is a system for scanning both trunks and soil to detect and quantify trunk decay and to produce maps of the subsurface structural root density, location and depth. The system is based on ground-penetrating radar (GPR) and represents a novel application of GPR applied to arboriculture. How Long did it take to Develop the TRU System? 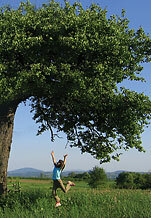 The TRU System was a 5-year development effort and was introduced to the arboricultural market in Fall 2004. How Long has Ground-Penetrating Radar been in Existence? GPR is a mature technology and has been sold commercially for over 20 years. There are three major world-wide manufacturers located in the US, Canada and Sweden, respectively. GPR's main uses include concrete inspection (looking for concrete integrity and rebars), asphalt roadway thickness, bridge structural integrity, buried utilities, and buried historical sites. TRU is a novel application of GPR for tree trunk and root inspection and a patent was issued in 2003 reflecting this novel application. Is the Radar Safe? Yes. Tests conducted for the U.S. Federal Communications Commission show the instrument to be ten times safer than your cell phone. Why is it said that a TRU Inspection is like "Giving Your Tree a Physical Exam"? If no problem is found when you have a physical exam, nothing further needs to be done. If a problem is found, you are normally referred to a specialist (e.g., cardiologist, rheumatologist) to look further into the specific problem detected. The same is true of your tree. Think of a TRU inspection as being its physical exam. If no decay or other problem affecting its structural integrity is found, nothing further needs to be done. If a problem is found, a specialist – a certified arborist – is consulted to assess the implications of the inspection as regards your tree’s structural integrity. Do the TRU Scans and the Analysis Report Constitute a Diagnosis? No. TreeRadar personnel are not certified arborists and cannot make a diagnosis. The non-invasive images of the internal trunk give the predicted remaining solid wood. The non-invasive images of the subsurface structural roots show root locations and depth. These quantitative results, along with traditional arboricultural criteria such as the presence of external cavities, broken or falling limbs, existence of fungal bodies, etc., should be used by a certified arborist to make a risk hazard assessment of your tree. Wavelength – Target Size (Diameter) – What is Smallest Detectable Size? 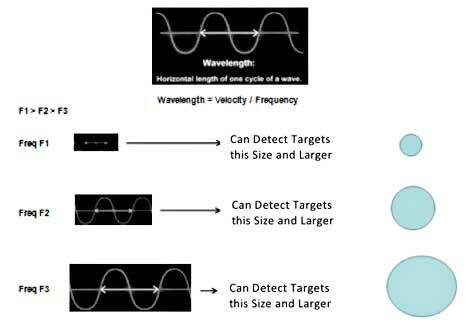 Wavelength – Target Spacing – What is Smallest Detectable Space between Targets? What is the difference between Single-Sensor and Multi-Sensor Inspection Systems? Please click the link below for an explanation. Single Sensor (SS) Systems operate with a one sensor that acts both as a transmitter and receiver. The single sensor creates and transmits the pulse – input wave – via its pulser electronics, and receives the return wave – reflected wave (“echo”) – via its receiver electronics. A SS system is therefore known by a number of names – single-sensor, pulse-echo, reflection systems. An example of a SS stem inspection system is the TRU (Tree Radar Unit) system which operates with an electromagnetic radar sensor. The advantage of a SS system for stem inspection is that it is easy to use since there is only one sensor to worry about, and setup is extremely rapid. Scanning is also simple and rapid. Further, it can be used at high elevations and in difficult-to-reach locations. The electromagnetic radar wave is unaffected by temperature variations so scanning in different seasons and climates does not affect the system’s performance. The electromagnetic wave is very sensitive to incipient (early-stage) decay. A major advantage is that a SS system is totally non-invasive. The disadvantage of a SS system is that the single incident wave is reflected from a given location around the circumference and, if a target is present (e.g., cavity), the incident wave does not ‘see’ all sides of the target with at any given circumferential location. To image all sides, the sensor must be scanned around the circumference in a complete 360-deg manner collecting reflected waves for each incident wave at reasonably close proximities. A very bumpy stem or large cavities in the stem will cause certain areas to be either uninspectable or require sector (partial circumferential) scans to be conducted on either sides of large protrusions or cavities. Multi Sensor (MS) Systems operate with multiple sensors, usually 10 or more, spaced around the stem in a more or less regular fashion, namely, approximately equally spaced (unless stem geometry dictates otherwise and then it is up to the inspector’s judgment). Each sensor has its own pulser/receiver electronics, so there are N P/R electronic packages for the N sensors. The MS system creates and transmits a pulse for each of its N sensors, in turn, and for each such pulse the reflected and refracted wave is received by all other N-1 sensors acting as receivers. So, each of the N sensors takes a turn at being a pulser while the other N-1 sensors act as receivers, which means that N experiments must be run for a complete 360-deg inspection. A MS system is known by a number of names – multi-sensor, pitch-catch, thru-transmission systems. Many operate as computer-assisted tomographic (CAT) systems. An example of a MS stem inspection system is the Picus system which operates with sonic sensors. The advantage of a MS system for stem inspection is that the multiple pitch (incident) waves and catch (reflected, received) waves scenario means that all sides of an internal target can be ‘seen’ once the N experiments are completed and the reconstruction software is run. All sides of an internal target can be imaged since the pre-positioned sensors permit “scanning” without physically moving a sensor. The issue of a very bumpy surface is not such a problem here because the sensors can often be mounted in locations to avoid the protrusions, while still being reasonably equally spaced around the circumference; however, there can still be areas where the sonic wave becomes trapped and/or re-directed by these bumps which cause erroneous velocities to be recorded. Additionally, the MS system does not have the same travel distance limitation in wood as the SS system because all travel distances are 1-way – transmitter to all receivers – rather than the 2-way travel required for a SS system. The disadvantage of a MS system is that stem inspection is considerably longer because the setup required is more extensive – hammering in nails, making stem measurements, etc., in the case of Picus. It is also ‘minimally’ invasive. Because of the need for a very precise setup, a MS setup is usually used only in one elevation for stem inspection but it can be used at multiple elevations if the inspector is willing to put in the time. It is not practical, though, for scanning at high elevations or on limbs. Another disadvantage of a sonic-based MS sensor system is that it can be temperature sensitive since the sonic wave velocity varies with varying temperature and this can modify the results. The sonic wave is not very sensitive to incipient (early-stage) decay. The system is invasive, and claimed to be “minimally invasive” by its developers. How Long does it take to Set Up a Scan? There is no setup or preparation of the tree required. Setup only involves removing the field computer and antenna from their cases, connecting them with the control cable, and recalling the appropriate setup file stored in the computer's memory. This is done in a matter of minutes. How Long does it take to Perform a Complete Multi-Elevation Trunk Scan? Each 360-degree circumferential trunk scan requires the time it takes you to walk around the tree, about 15 to 20 seconds. A complete trunk scan, usually at four to six elevations, takes about 20 minutes including setup. What Happens when Access is Limited due to Obstructions? If access to the trunk or root bed is obstructed due to physical constraints or large cavities, etc., sector scans, which are scans over a portion of the area, can be performed. How do I Scan a Very Bumpy Tree? This is a common occurrence with many mature hardwoods. Scanning over bumps, protrusions, and small cavities will cause a temporary loss of data which is not a problem because of the hundreds of readings being automatically recorded throughout a scan. Some hardwoods, such as London Planes, have large nodules throughout their trunks that make scanning difficult. In these cases, sector scans conducted between the nodules, are the best approach. How can I Scan at the Base Level? The "Point" mode is used to make TRU into a "virtual drill" at the lowest elevations. See the description in the Trunk Inspection section. What if Trunk Decay is Found? The extent of the decay column is shown by the multi-elevation scans, and the amount of remaining solid wood (RSW) is shown by both the cross-sectional image and the plot of RSW around the entire circumference for each elevation. If decay is found, the location and extent of the decay pocket, along with the amount of RSW can be used by a certified arborist to determine if the tree has sufficient structural integrity to remaining standing (and be reexamined periodically), or if there is sufficient risk to merit a recommendation for removal. The presence of decay, sometimes even extensive decay, does not necessarily mean the tree needs to be removed. What do the Four Colors Used for Trunk Decay Detection Mean? Red indicates near-surface decay with the remaining solid wood less than 3 in (7.5 cm). Orange (less red) indicates decay with the remaining solid wood greater than 3 in. Gray indicates an internal reflector that is not decay – such as a moisture interface or a change in wood density/composition - and does not affect the tree's structural integrity. Brown indicates solid wood. Does TreeRadar ever Recommend Drilling the Trunk? The common consensus among arborists is that trees should be drilled only if there is strong evidence of decay. If trunk decay found by TRU is extensive enough to cause a certified arborist to render a risk hazard decision, it may be wise to get a "second opinion" by drilling the tree at a few locations, using the radar cross-sectional image maps as a guide, to confirm the TRU results. What is the Lowest Point on the Trunk that can be Scanned? An elevation of 2 ft (60 cm) above the base can usually be scanned. Depending on the curvature (flare) of the base, an elevation of 1 ft (30 cm) can sometimes be scanned. The point mode of data collection is the main "virtual drill" procedure for recording data at the base level. Can Scans be made at High Elevations? Yes, either in a bucket truck or by a climber as shown in the Trunks page of this website. Why is TRU called a "Virtual Drill"? Radar waveforms are automatically pulsed and internal trunk reflections recorded for every 0.2 in (5 mm) of movement around the entire circumference (for each elevation scanned) to determine if decay is present. If so, the amount of remaining solid wood is calculated. This is equivalent to "drilling" a hole every 0.2 in (5 mm) around the circumference; hence, a "virtual drill". What Internal Trunk Conditions can cause False Calls? The radar electromagnetic wave is very sensitive to internal trunk interfaces that cause reflections. It is particularly sensitive to moisture and air pockets. These interfaces include: (1) complete decay (hollow – air pocket), (2) early stage decay (incipient, “punky” wood – partial air and moisture), (3) large moisture gradient (such as a sapwood/heartwood interface, or a resin pocket in a conifer). A hollow is highly unlikely to be mistaken for anything other than a hollow. But it is possible to mistake a large moisture gradient reflector, which is a benign condition, as decay. This can be avoided by the use of the TreeWin software signal processing algorithms that have the capability of identifying each type of interface. In those tough-to-call cases, TreeRadar personnel will recommend a test coring or drilling, using the radar cross-sectional maps as a guide, to confirm whether the reflecting interface is benign or early stage decay. What External Trunk Conditions can lead to Suspect Data? A very bumpy outer surface that can sometimes cause the antenna to be misdirected is another limitation. In these cases, the inspector has been instructed to press a “marker” button that tags the data file to indicate to the analyst that the area just scanned has suspect data due to antenna misdirection and should be ignored. What Factors Contribute to the Decision Accuracy with Incipient Decay Present? While the radar electromagnetic wave is very sensitive to the interface between early-stage (incipient) decay and solid wood, and can detect this condition, it may not be able to give a precise thickness of the remaining solid wood across the complete periphery. This is usually due to external trunk scanning conditions such as very bumpy spots that cause temporary antenna misdirection. How Do I Scan for Roots? Two ways. The easiest, and most common, way is to use the mobile scanning cart. If access is limited, such as scanning in a narrow strip of ground between a tree and sidewalk or between rows of plants, the extendable handle works best. Both methods are shown in the Roots page of this website. How Long does it take to Perform a Root Scan? The calibration setup required for root scanning takes about 20 minutes. Following setup, each scan line, whether linear or circumferential, usually takes about 2 minutes. Can Roots be Scanned under Ground Cover? Yes. GPR can penetrate ground covers such as concrete, asphalt, paving plates and brick. The TRU system automatically calibrates itself to “look through” the hardscape cover and penetrate to the roots below. What Depth can be Examined for Root Scans? The maximum penetration depth using the supplied antenna (900MHZ) is 39 in (1 m) in an average soil, which is well below the depth at which most structural roots are found. An (optional) lower frequency antenna (400 MHz) can penetrate down to 9-12 ft (2.7-3.7m). How does the Soil Composition affect Root Scans? The TRU system automatically calibrates for different soil conditions. The penetration depth is approximately 39 in (1 m) in a loamy mixed soil. The penetration depth increases as the sand content increases, and decreases as the clay content increases. The most difficult soil to penetrate is very high and wet clay (nearly 100% clay) that is very close to the surface. Lower clay layers, which are common, do not affect signal penetration. The TRU system automatically calibrates for different soil conditions. TreeRadar has developed special signal processing algorithms that can compensate for difficult soils. What is the Smallest Root that can be Detected? A root diameter of 0.4 in (1 cm) is the smallest root that can be detected. Can Buried Utilities be Detected? Yes. Buried utilities – metal pipes, air-filled or liquid-filled pvc pipes, electrical lines – are easily detected and their location and depth are recorded. Do Buried Utilities "fool" the TRU System into Thinking they are Roots? No. Three radar reflectivity features of buried utilities distinguish them from roots: (1) their reflected amplitudes are significantly larger than roots, (2) they are located at known depths (determined by local building codes) and (3) they are usually straight and at constant depths. Do Rocks "fool" the TRU System into Thinking they are Roots? Yes, but only momentarily. A rock, which is usually a good reflector, produces a “root-like” reflected signal whenever it is encountered. However, rocks, unlike roots, do not persist from scan line to scan line, so they can be identified and ignored when the final map is produced. Why is TRU called a "Virtual Excavator"? Radar waveforms are automatically pulsed and subsurface soil reflections recorded for every 0.2 in (5 mm) of movement throughout a subsurface roots scan line. Whenever a root is detected, its location and depth is determined. A 2D planar image, created by the off-line TreeWin™ software, shows the same depth view that would be made by a backhoe or a hyper-sonic air excavator; hence, a "virtual trench ". When will a Root Sizing (Diameter) Function be Available? We are presently working on a root diameter sizing algorithm and our goal is to have this incorporated into the TreeWin software in 2006. When will a Root Decay Prediction Function be Available? We are working on algorithms that can predict if a root is decayed. Our goal is to have this feature incorporated into TreeWin in 2006. What are the Factors that Affect Accuracy? The main difficulty for root scanning is due to soils that have very high and wet clay content (nearly 100%). This soil type reduces the amplitude of the reflected radar wave and makes detection of roots difficult. This is a well-known limitation of GPR for soil scans. There are special TreeWin software signal processing algorithms that have been developed to minimize the amplitude-reducing effects and to enhance the detection of the subsurface roots. However, there are some soils where these algorithms are not able to reduce the masking effects sufficiently and, so, root detection is not possible in these cases. How Portable is the System? Very. The three components – field computer, scanning antenna and control cable – can be carried in a backpack or in two carrying cases. How Much does the Equipment Weigh? The hand-held antenna weighs 5 lbs (2.3 kg) and the field computer weighs 8 lbs (3.6 kg). How Many People are needed to Operate the Equipment? Two are recommended for trunk scanning, although one person can do the job. One person can do root scanning. How Field Rugged is the System? Very. The field computer, which uses the Windows Cnet operating system, has no internal hard drive. Instead, the field computer uses internal compact flash cards so that, if dropped, it will not suffer a terminal blow. There is no keyboard, only large push-button keys, so the computer can be placed in a protective plastic covering for use in the rain. The display is transreflective so that it can be viewed in outdoors light. The antenna is also very rugged and can operate in the rain. All connectors are mil-spec canon type and very rugged. The two Pelican carrying/shipping cases are extremely rugged. What type of Batteries are Used and How Long do they Last? Standard laptop-type batteries are used. A battery provides up to 3 hours of continuous use, and up to 6 hours if the system is "put to sleep" between scans. A battery can be recharged in 3 hours. Two batteries and a battery charger are supplied with the system. "As a TRU Technician I am often asked this question in relation to both Root Scan and Stem Scan results. The answer is probably more complex than people expect, and involves a different question: What information do you need to have? i) In relation to Stem/Trunk Scans: What information do you need to have? As an arborist, I am generally called to assess the integrity of a tree that already exhibits signs of decay. TRU is used to quantify the extent of decay and to give a percentage of Remaining Sound Wood (RSW) in relation to that decay. This percentage is used in a formula to establish whether the tree is structurally safe. My sole reason for using TRU is to quantify the RSW without compromising the tree's remaining defences. Because TRU represents the stem as a circle, the actual shape of the decayed area/cavity is distorted. However, the accuracy of TRU is not in its representation of the shape but in its ability to quantify the RSW. For this purpose I have found TRU to be an invaluable assessment tool and as accurate as I need it to be in order to do my job. For example, we recently recommended removal of a tree, based on TRU Stem Scan results, and I went along to witness removal of the tree. Actual decay present in the tree matched TRU predicted results to within 1 or 2 cm (0.4 or 0.8 in). Had the cross section of the tree been perfectly round, I believe the match would have been exact. ii) In relation to Root Scans: What information do you need to have? Generally when I am called to carry out a Root Scan, the client simply wants to know “Are roots present in the area in which I wish to build/lay my drive/dig a trench?” or “I want to install a service pipe/cable underground without damaging the trees root system. How deep do I need to bore to allow me to do this?" TRU can accurately answer these questions. The degree of accuracy depends upon: a) the degree of accuracy required; b) the skill of the operator; c) the information available to the operator and; d) the information presented to the data analyst. Recently I was called upon to carry out Root Scans on a large fig tree in Brisbane, Australia. The client wanted to move this mature tree (with a canopy in excess of 30 metres diameter) to make room for a new freeway bypass. The root scans were to ascertain the depth and profusion of the root system of the tree, and to enable the tree moving specialists to estimate the amount of root plate they would need to move the tree while retaining the health of the tree. The depth was important, as the framework of steel channel had to be installed while minimizing damage to the deeper roots. TRU predicted roots down to 40-50 cm (16-20 in), so the root plate framework was installed at this depth. When the tree was lifted (a long arduous process as you can imagine), all of the roots were found to be in this predicted area." - David Gunter. TRU Technician, Gold Coast, Australia. Why is the Off-Line Analysis done by TreeRadar Personnel? We believe this is presently the best approach for several reasons. The TreeWin software module is in a regular mode of upgrade, so having only one copy on one server eliminates the problem of users regularly having to install upgrades and insures a uniformity of analysis. Also, the reflected radar waveforms from internal tree trunk conditions are complex and experience with signal processing techniques and software is important for accurate interpretation of these waveforms. Experience gained by regularly performing analyses provides TreeRadar personnel with insight for ways to improve both the algorithms and the program. Are there Plans to make the TreeWin Software Available? Yes. Our goal is to include the TreeWin software with the TRU system – both to current and new customers – so that trunk and root analyses and reports can be generated by system owners who wish to have this capability. We are working on automating the analyses. Can the TRU System be Used for Research Purposes? Yes. The electromagnetic radar wave is sensitive to many types of internal trunk conditions – hollows, 'punky' wood, moisture, wood composition changes, wet wood, etc. – some of which relate to structural integrity (hollows, punky wood) and others of which do not. These other reflections, which can be identified by the off-line software analysis program, can be useful to researchers studying tree biology. How much Interaction takes place between TreeRadar and TRU System Owners? A lot. TRU is the first system available for both trunk and root non-invasive inspection and there is much to learn about both components of a tree’s structural integrity. TRU is an evolving system and when something new is learned, we immediately incorporate it into the TreeWin analysis software. We believe strongly in interaction with our customers and rely on them to provide information and insights on species not yet inspected, interesting decay patterns, etc. This is a win-win situation because interaction causes the system to evolve in ways designed by its users. Are there Plans to have a TRU User’s Group? Yes. The TreeRadar User's Forum is currently under construction in this website where users will be able to post messages, comments and questions to other users and, in general, share their field experiences. What is the Warranty – What Wears Out? The equipment warranty is two (2) years and covers all components except for batteries. The system is very rugged. GPR systems like this one have been operating for over twenty years. The most common problem is sticky buttons on the field computer after some years of use. The TRU™ System is composed of thee easy to use devices. The Field Computer and Radar Antenna are used together for trunk scanning, and the Scanning Cart is added for root scanning.